I saw a feature in In Style magazine a few years ago on some fabric bead necklaces by Louis Vuitton, and I ripped it out for my Inspiration Binder. These bad boys retail for over $800 (!!!). Like, holy frig who has that kind of money for a FABRIC necklace?!?!? No diamonds or gold or anything!!! Well I figured I could probably make my own for a mere fraction of the price. So I did some Googling. During my Google search last year, I came across a tutorial for a fabric necklace that I really liked. Unfortunately I can't find the blog again... So I've re-created the tutorial, but if you are the original author of said tutorial PLEASE let me know and I will update my blog with the correct link. Measure the diameter of your beads (mine were about 8cm, or just over 3"). 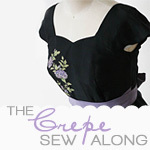 Add 1/2" to allow for a seam allowance of 1/4" (1/4" on either side of the rectangle). This will be the width of your fabric strip. Decide how long you would like your necklace to be. 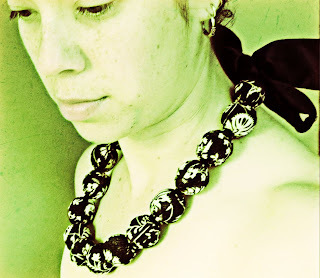 I wanted something that would sit nicely on my collarbone, as opposed to a choker or a dangly necklace. But it's totally up to you! My fabric strip was approximately 4" wide by 28". Cut the rectangle from your fabric. Fold the fabric right sides together (right side = the "outside" side of your fabric). Sew along the long edge using a 1/4" seam allowance to form a long tube. Step 3: Press the seam allowance apart with your iron. I have a handy-dandy turning tool, but a safety pin works too. Push one bead inside the tube, moving it down until it's in about the middle of the length of the tube. Tie a knot in the end of your embroidery thread and sew through the fabric on one side of the bead. Twist the fabric tightly and sew through the tube a few times to anchor the embroidery thread. Push the needle through the hole in the bead until it comes out the other side. Twist the fabric around the other side of the bead and sew through the thickness a couple times to anchor it. Wrap the embroidery thread around the outside of the fabric a couple of times to desired thickness. That's pretty much it, just keep repeating the steps as you go along. Slide another bead into the tube, anchor the embroidery thread on one end, push the needle through the bead, and twist and anchor the fabric on the other side. Wrap the embroidery thread around the fabric between each bead. 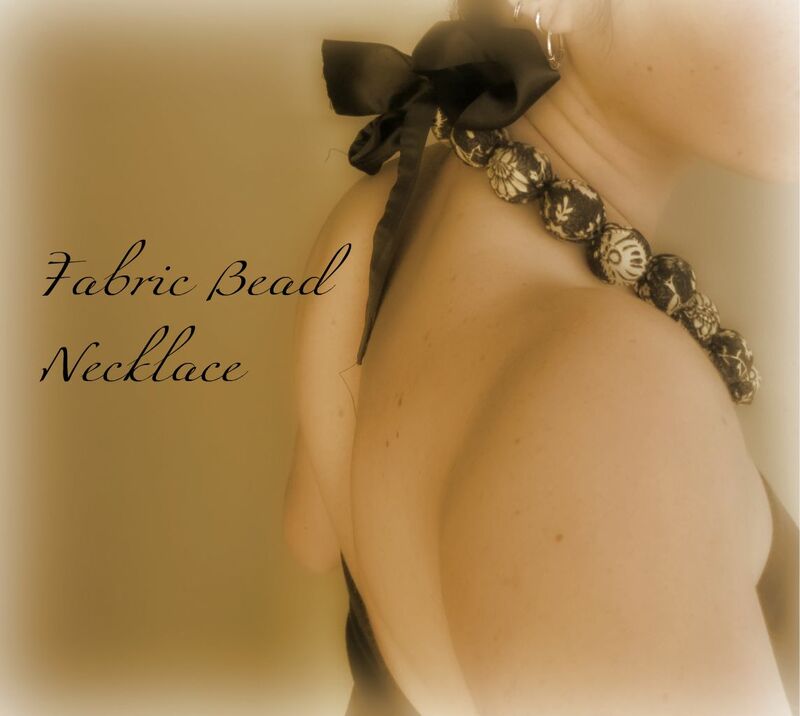 Once you've completed the necklace, simply attach the ribbon to your fabric tube. Et voila! 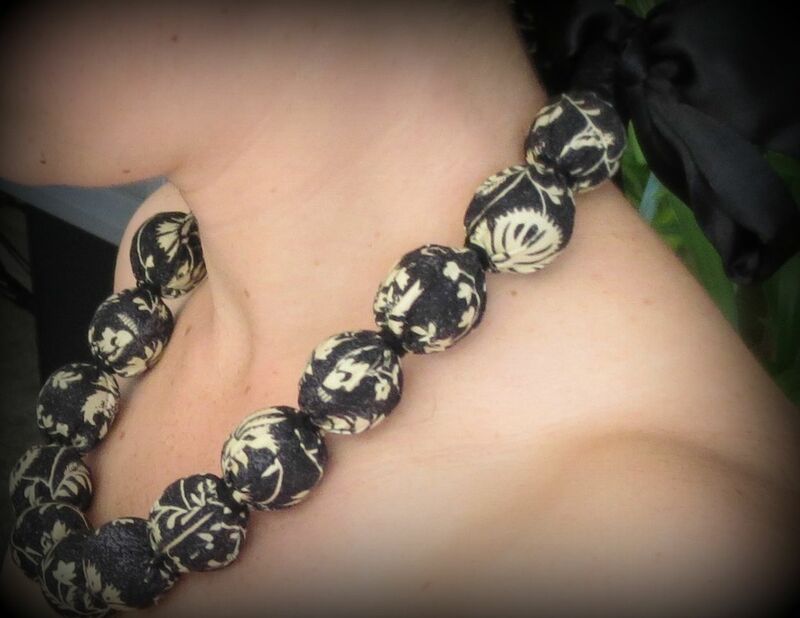 You've got a snazzy new fabric necklace! I spent $6 on wooden beads, and already had the fabric and embroidery thread in my stash. So this necklace cost me less than $10. Considering the Louis Vuitton necklace retails for $850, that's a savings of more than $840!!! Holy cats! Very cool! I'm always looking for ways to save $840! Great tutorial. Your necklace looks lovely. I've wanted to do sth similar for a while but I can't find wood beads. I bought mine at a big box craft store in the city(Michael's is the name, I'm not sure if it's just a North America thing). Maybe next time you're in a big city you could find a craft store? Good luck!